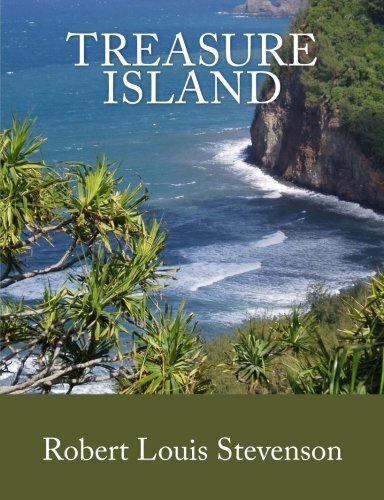 Amazon.com description: Product Description: This premium quality large print edition includes the complete unabridged text of Robert Louis Stevenson's classic tale of "buccaneers and buried treasure" in a freshly edited and newly typeset edition. With a large 7.44" x 9.69" page size, this Summit Classic Press large print edition is printed on heavyweight 60# bright white paper with a fully laminated cover featuring an original full color design. A complete and unabridged counterpart of our standard edition, by increasing the page size along with the font size we are able to reduce printing costs and make complete, unabridged top quality large print editions available at reasonable cost. This edition also includes an original biography of the author and original annotations, inserted sparingly, to aid the modern reader with especially unusual words or phrases. Peg legs and parrots, buried treasure, the "Jolly Roger" and "fifteen men on a dead man's chest"... with Treasure Island Robert Louis Stevenson indelibly marked forever the perception of pirates for future generations. The tale that became Treasure Island began with a "treasure map" drawn for his 12-year-old stepson and the pirate story Stevenson spun to go along with the map. Published in serial form in 1881 and 1882 and in book form in 1883, Treasure Island brought him widespread popularity, launched his career as a profitable writer, and by the end of the 1880s, was one of the era's most widely read books. One of the world's truly beloved books, it has been widely read in many languages since its original appearance, and the story is one of the best-known around the world thanks to endless reprintings and translations, as well as films, comics, television and numerous other adaptations. Beginning with the appearance of an old seaman, Billy Bones, at the Admiral Benbow Inn run by his family, young Jim Hawkins is drawn into a great adventure: the search for the treasure of the legendary pirate Captain Flint, buried on a remote island. Probably the most unforgettable character is the wooden-legged, parrot toting seaman, Long John Silver, utterly amoral and without scruples, ruthless and violent, but undeniably possessed of courage and quick wits, an unusual character for young readers' literature then, and even now. Robert Louis Stevenson was born in Edinburgh, Scotland, on November 13, 1850. A sickly child, Stevenson was often unable to attend school for lengthy intervals. Although he did not read until he was seven or eight years old, Stevenson had begun dictating stories to his mother at a very early age. Stevenson's first book of short fiction, New Arabian Nights (1882), was one of the United Kingdom's earliest successful collections of short stories, a literary form which had previously been dominated by Russian, American and French writers. The 1880s witnessed both a marked decline in Stevenson's health and the most productive period of his career. Bedridden with increasing frequency and for longer durations, writing was one of the few activities he could manage, and while in this condition he wrote the bulk of his most enduring and popular fiction. In 1888 Stevenson and his family set sail from San Francisco to travel the islands of the Pacific Ocean. In 1889 they arrived in Samoa, where they settled and built a house. The island setting stimulated Stevenson's imagination and influenced his writing. Several of his later works are about the Pacific isles. Although best known for his fiction and, to a lesser extent, nonfiction, Stevenson was also an accomplished poet and a proficient musical composer. Robert Louis Stevenson died, probably as a result of a cerebral hemorrhage, on December 3, 1894, at his home in Vailima, Samoa. He was forty-four years old.